We stopped in the city of Napa to have dinner at Grace’s Table. We didn’t know a thing about the restaurant, but we were happy to find that they had a lot of local food. Everything we tried was absolutely awesome. 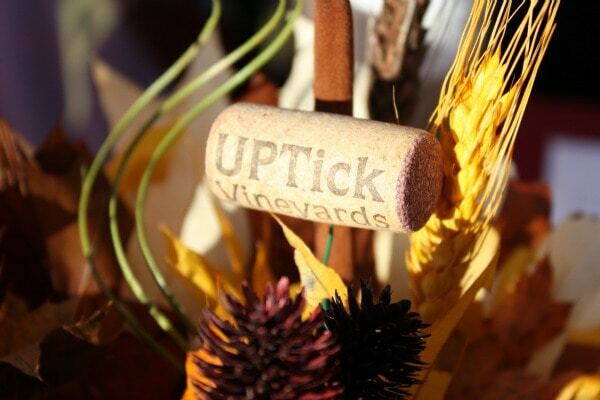 The main purpose of our trip was to see our friend’s at UPTick Vineyards, who were hosting a Harvest Festival. 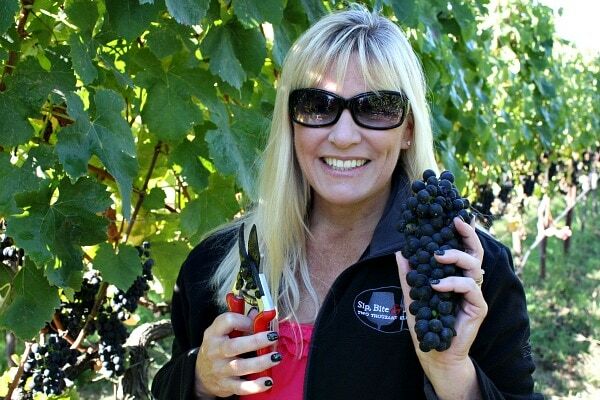 We love these friends, and we love their wines too! 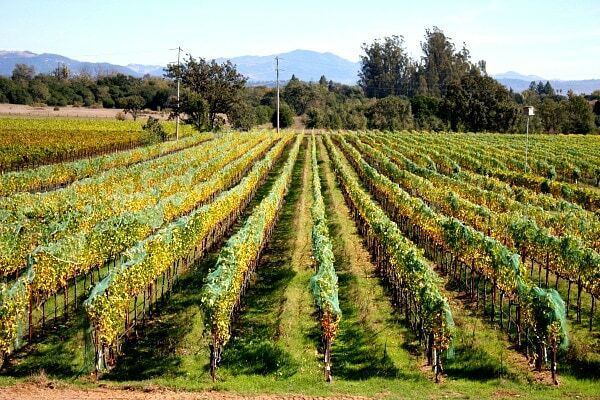 They have beautiful vineyards on the grounds of their estate in Sonoma County. 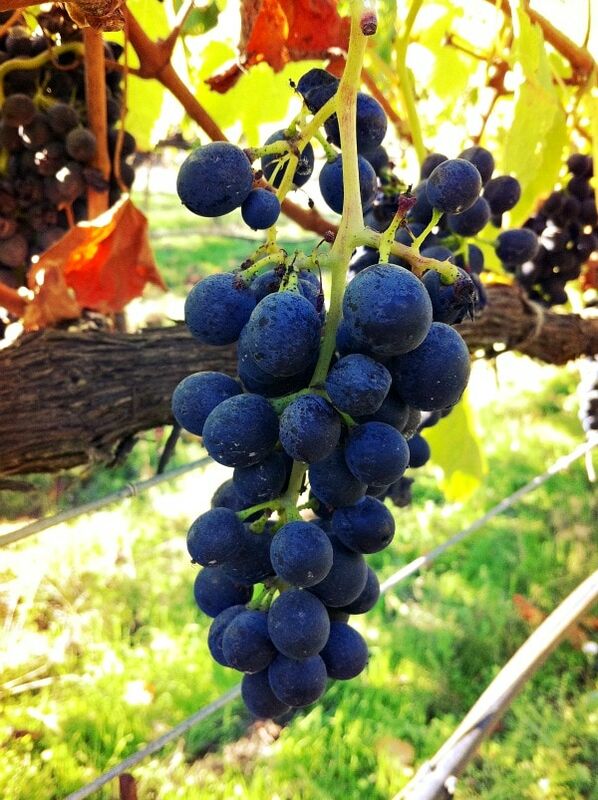 We got a chance to harvest some of the grapes and clip them off the vines. Then vineyard manager Adam showed us how the grapes are pressed using this crank machine. And he also let us stomp some grapes (I Love Lucy- Style), just for fun. It was definitely fun! 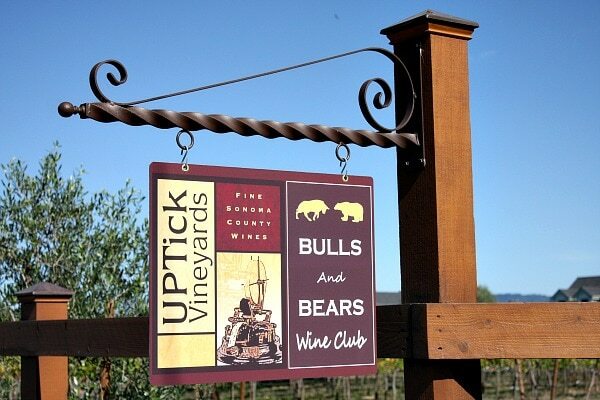 UPTick Vineyards has a tasting room in Windsor, and they have a wine club too. My husband and I are big on wine. 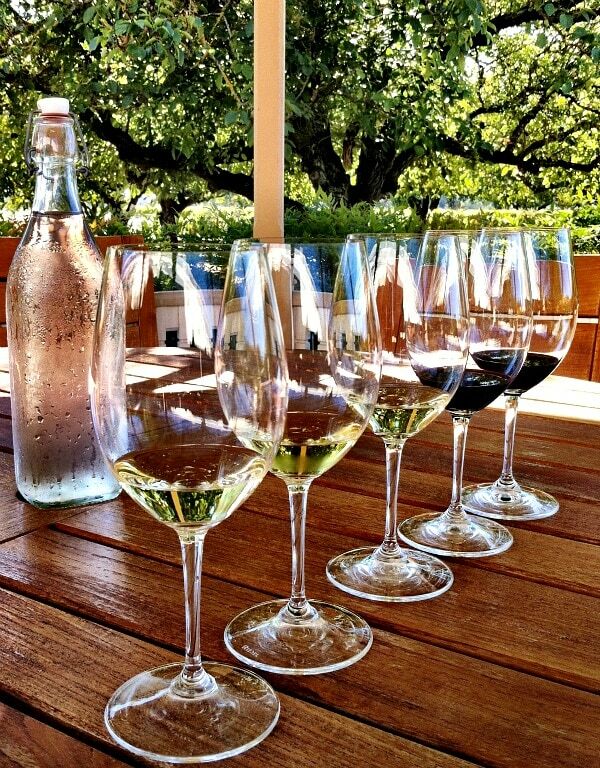 We sample many varieties and appreciate good wine. This is good wine! Barrel tasting was among the activities for the day. This cutie here is a pet on the UPTick Vineyards property. 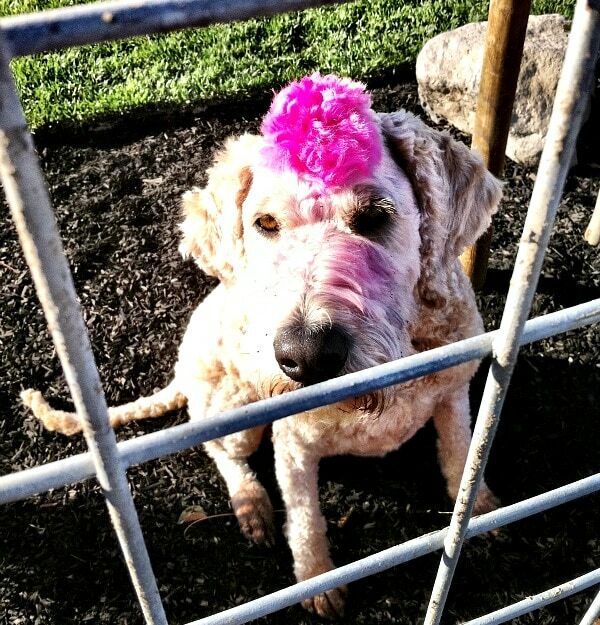 All decked out with a pink mohawk. Happy Halloween? Turns out that our friends like to have some fun with cars. 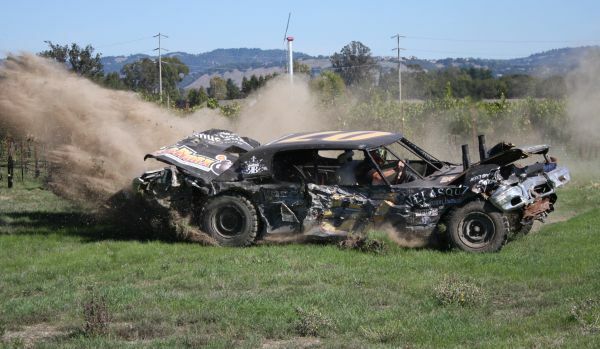 This is the UPTick Vineyards demolition derby car. Vineyard Manager Adam demo’d it for us. 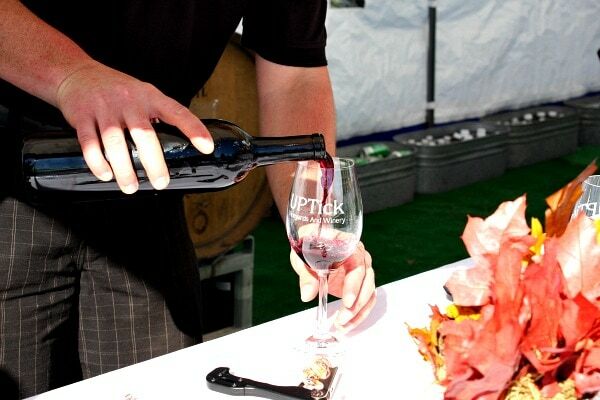 It was a great day at UPTick, and we left with a case or two or three of wine. I think we’re all set for a while. After our day at UPTick, we went to visit my friends at Kendall Jackson Winery, who set up a wine and cheese tasting for us. Doesn’t this look heavenly… a private gazebo overlooking a walnut trees and greenery… so peaceful and quiet and perfect? 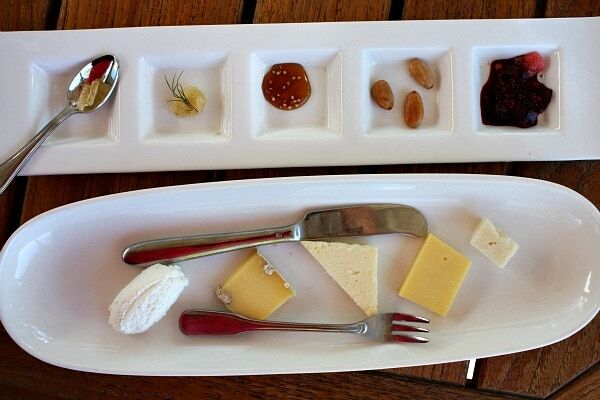 Chef Matthew set us up with cheeses paired with individual condiments. We took a drink of the wine, then a nibble of cheese, then another taste of wine, then cheese + condiment, then another taste of wine. It was very cool to see how the flavors of the cheeses and condiments really matched what we were tasting in the wine. I fell in love with these in the Kendall Jackson gift shop. 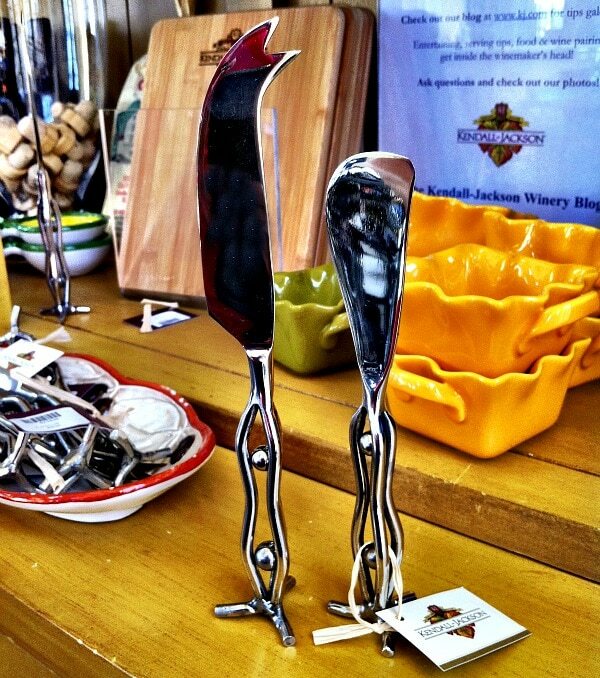 Stand-on-their own cheese knives and spreaders. I bought 3 of each to take home to give as hostess gifts to friends! We bought more wine here too. Now we’re really set for a while! 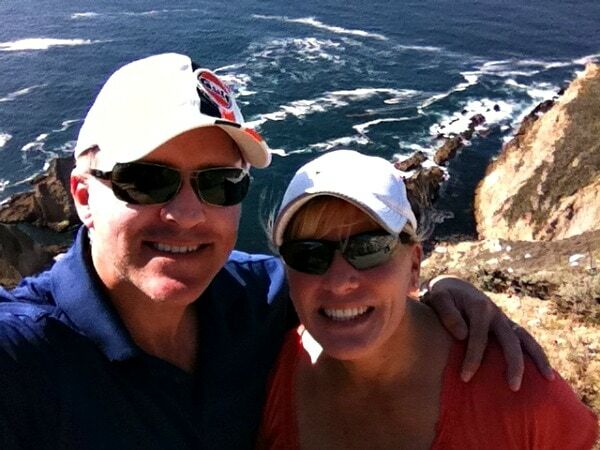 Our trip was quick… but we took a couple of days to drive home along the California coast. This was pretty much our view most of the way. And then there were scenic stops like this. I drove my husband crazy by saying, “Pull over!” every few miles or so. We drove all the way from Sonoma to Montecito (near Santa Barbara) on the first day. 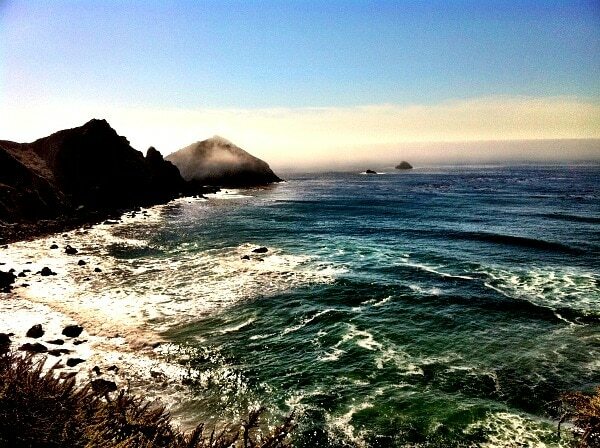 If I did it again, I’d FOR SURE stop and stay somewhere in Big Sur too- which looked adorable. 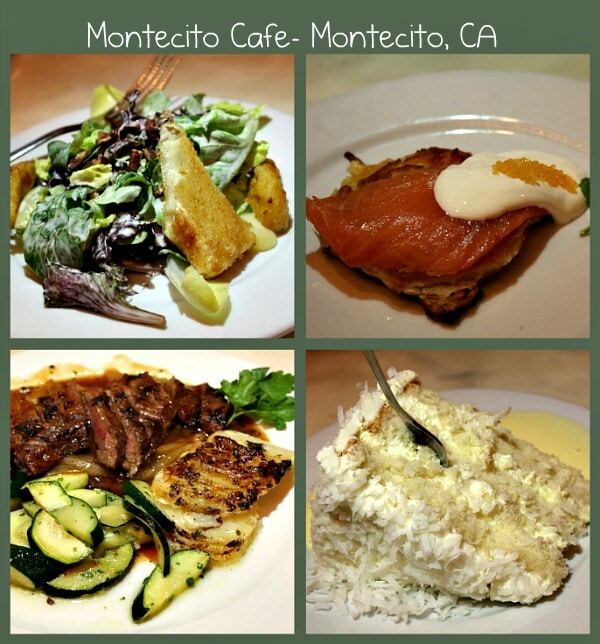 We stayed at the Montecito Inn. It was cute. Sort of quiet, even though it was quite near the freeway. The bonus was that it was right in town so you could walk to everything, and it had a wonderful restaurant and bar right on the property. Oprah and Rob Lowe are apparently local residents of Montecito. Our bartender told us that Oprah comes in often with no makeup on and doesn’t look anything like the Oprah on TV! 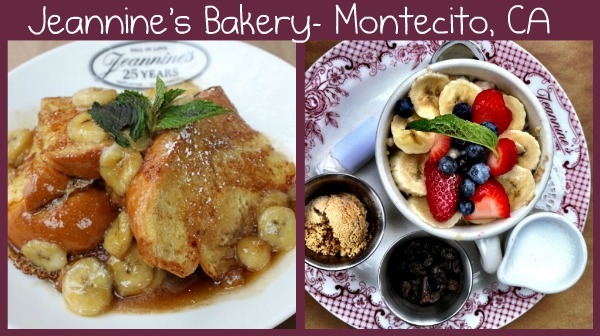 For breakfast the next morning, we found a treasure in downtown Montecito: Jeannine’s Bakery. 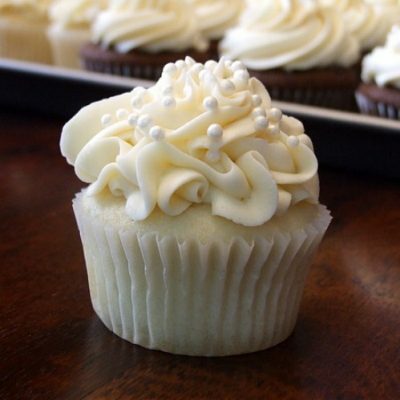 This place has a glass case full of many scone flavors, pastries and sweets, as well as a full breakfast menu. The next day we drove down toward Los Angeles. More gorgeous scenic views… but the fog started to roll in. Venice Beach was our next stop. 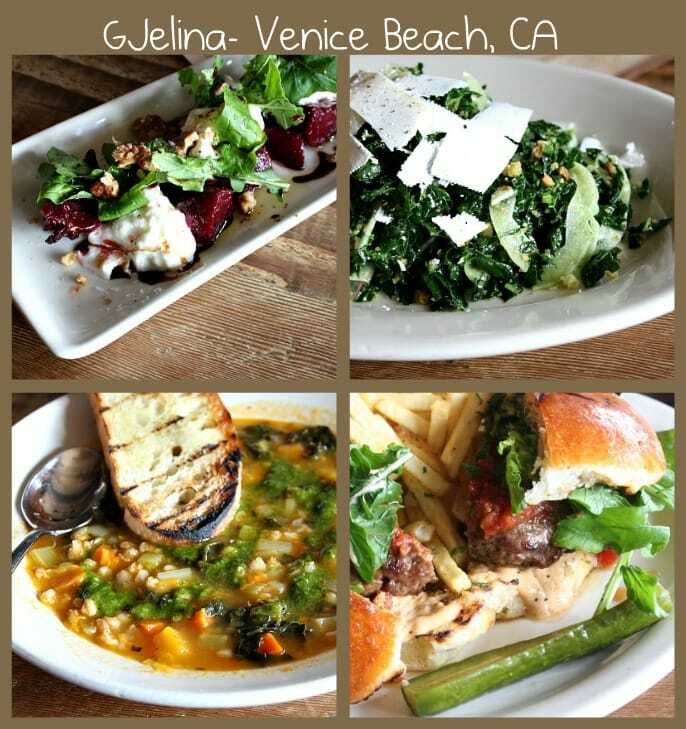 We’ve eaten at GJelina before for dinner (amazing! ), and we decided to stop here for lunch on this day. It was a great journey. Like a second honeymoon… I recommend it! The banana kahlua challah french toast looks amazingly good. 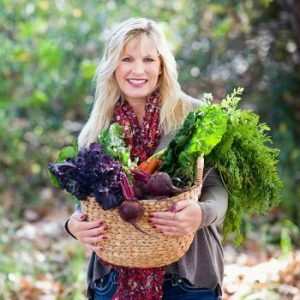 It looks as though you had an amazing trip, Lori – a food lover’s dream! By the way, you look fantastic. the food and scenery look absolutely picture perfect! i’ve been longing to see CA! What an amazing trip! Sooo jealous. Looks like you had an awesome time. This is our favorite vacation, too!! 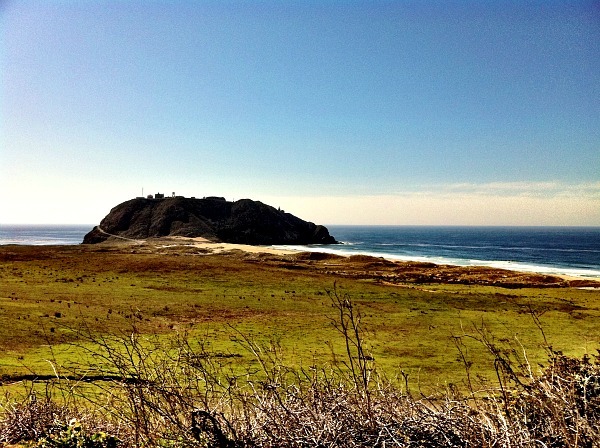 If you ever do this trip again, you MUST MUST MUST stay in Cambria. They have the most wonderful restaurants, and amazing bed and breakfast establishments. 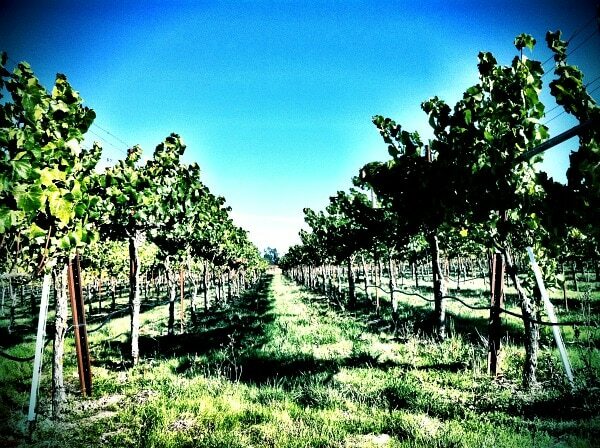 But more importantly, they are right next to Paso Robles! 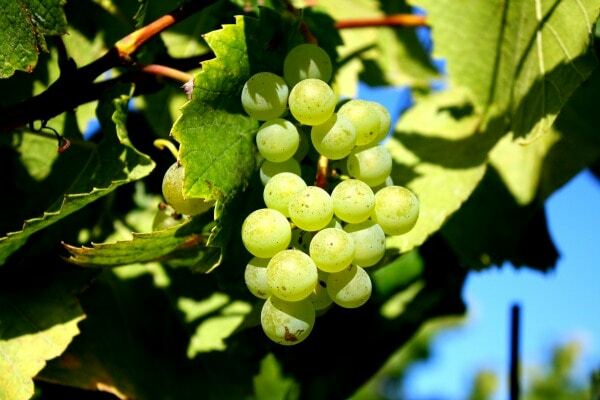 Napa is awesome for your white wines, but the central coast is the place to be for the reds. 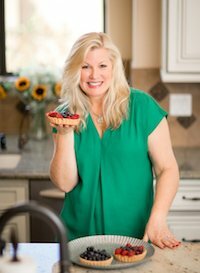 The food and wine in this community is beyond amazing! Really beautiful photos! Looks like you had a great time. 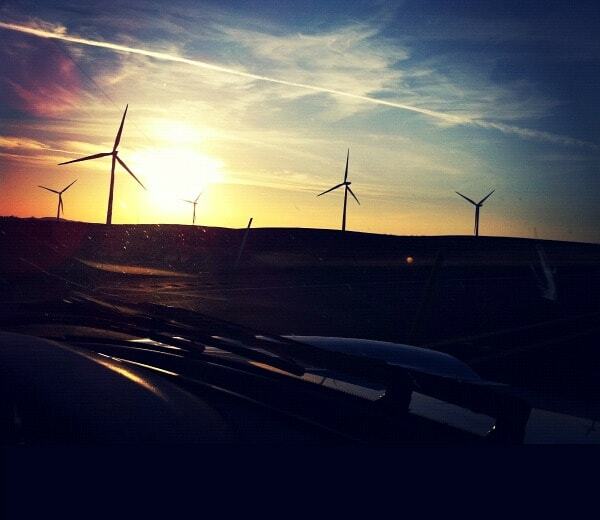 We drove some of that coast last summer – it is truly breathtaking. I live in Los Angeles and have made the coastal trip several times – though never in a convertible! It’s unique as a roadtrip because you enjoy not only the catharsis of driving, but also non-stop beautiful scenery and place after place to stop and enjoy cute towns and delicious food. Looks like you guys really made the most of it. I used to stay at the Montecito Inn when I played in the Santa Barbara Chamber Orchestra – very cute. Had never heard of that ice cream shop. 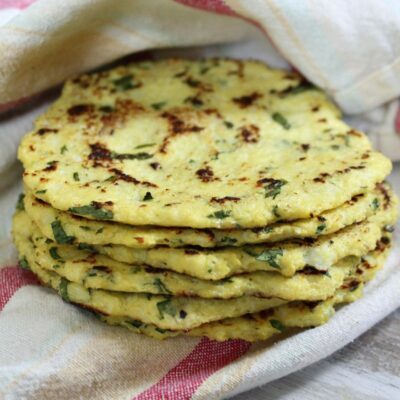 Gjelina is a favorite, too. Glad you had a great time! Boy you guys are a hearty bunch making that drive! I got antsy driving from Napa to Carmel! I was so bummed we didn’t get to see grapes on the vine when we were there but this brought back some great memories! AMAZING. And I could drink, like 27 of those wine flights. awesome! looks like a great trip! What a wonderful trip! 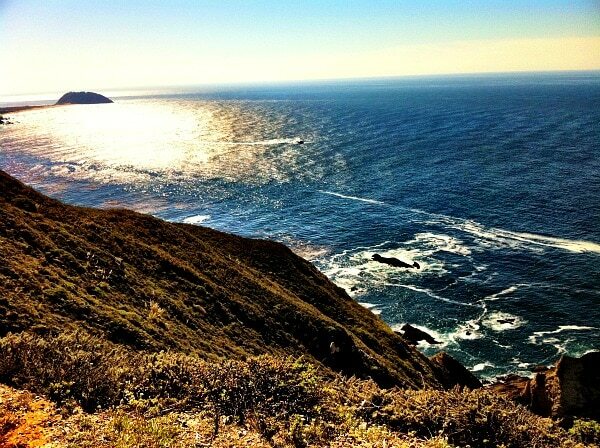 There’s really nothing like the California coastline to inspire, rejuvenate, romance and relax! 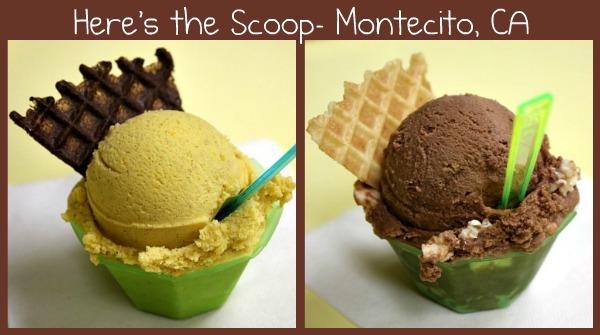 I went to college in Santa Barbara, and lived in Montecito – such wonderful memories! wow – the weekend looks incredible lori! So glad you guys had SUCH an amazing road trip. Wow!! Glad it was like a second honeymoon, and filled with beautiful pics, sights, food, wine…fabulous post, Lori.